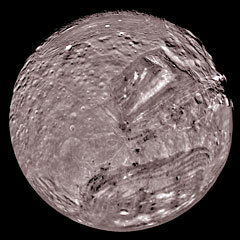 Miranda [mih-RAN-dah] is the eleventh of Uranus' moons and is the fifth largest. It is the smallest and innermost of the planet's five major moons and is without a doubt the most interesting. Miranda was named after the daughter of the magician Prospero in Shakespeare's The Tempest. Unlike the other moons in the Solar System, which are named after Greek and Roman mythological figures, the moons of Uranus are named after characters from classic literature. Miranda was discovered by Gerard Kuiper in 1948. Nearly everything we know about this moon was learned from the Voyager 2 encounter in 1986. Miranda is unlike any other body in the Solar System. Its surface is a jumbled assortment of curious terrains. 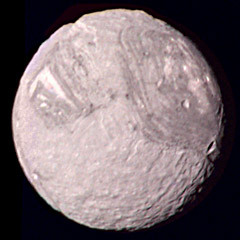 Miranda is thought to be composed of about water ice and half rocky material. The temperature of this icy world averages just -335 F (-187° C). Astronomers had expected this moon to show little or no history of internal activity, much like Jupiter's moon Callisto. But when the images came back from the Voyager 2 probe, everyone was amazed by what they saw. Miranda looks almost as if several different pieces of rock were glued together in a random fashion. There are huge faults, deep canyons, steep cliffs, smooth plains, and curiously shaped rifts. Astronomers once believed that Miranda had been shattered to pieces and reassembled several times throughout its long history. But more recent theories suggest that the upwelling of partially melted ices may be responsible for these curious surface features. The real reason is still a mystery. 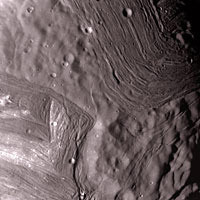 One of the most remarkable features on Miranda is known as the "chevron". It is a series of light and dark grooves arranged in a v-shape. This large feature dominates most images of the moon. 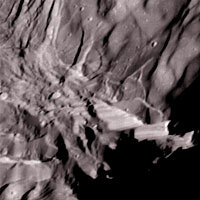 Miranda also contains fault canyons as deep as 12 miles (20 km) deep. This is a deep canyon for a moon that is only 290 miles (470 km) in diameter. 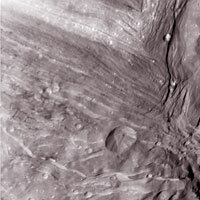 Several faults crisscross the valleys and ridges on Miranda. Some of these faults produce steep cliffs, or fault scarps. The largest of these cliffs is 3 miles (5 km) high, nearly three times as high as the walls of the Grand Canyon on Earth. 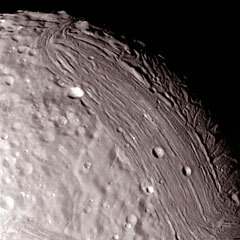 The rest of Miranda's surface is littered with grooves and craters. Many of these have exposed underlying material with a different albedo. Some of these ridges have been referred to as "layer cakes" or "race tracks" due to their unusual appearance. Miranda has no detectable atmosphere and no magnetic field.